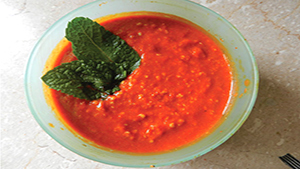 Imli ki chutney Recipe in English is an easy and traditional cooking recipe to prepare at home. It provides you an awesome taste of Chutney Recipes. Few drops of red food color. Put it on the stove in a pot with all your ingredients for ten minutes. Now put in grinder and grind it till paste. It is now ready to be served with Samoosa or Pakora. Hello this is a great chutney . I was first unaware of the tastes these chutney recipes rendered but later on when I indulged into the tastes of different chatnis , then I realized how tasteful these are and whether make a snack or not, you must enjoy chatni of different kinds. Imli ki chutney Recipe with aloo chap with a cup of evening tea its too ideal for relaxing.